The above description was not of a dinosaur but of the largest mammal ever found . . . the Paraceratherium (or called Indricotherium or Baluchitherium)! Strangely enough, this mammal is considered, by most, to be from the rhinoceros family and, as far as anybody can tell, is extinct. The neck of this creature seems to have been very thick, stocky but flexible and mobile. It seems he could easily use it to reach higher or lower food items if he so wished. This gives him an advantage of eating low when times are plentiful and high when times are less than plentiful. Strangely, this herbivore had some rather large front teeth that were conical and believed to have been used to strip off leaves and, with the help of the teeth on the bottom jaw, be sent back by the lips and then to be ground by the molars in the back. All rather strange but amazing. Unlike today’s rhinos, however, Paraceratherium did not have a horn(s) on his head. He was completely hornless but finely tuned to living the life he had as a gigantic beast. As can be seen in the above picture, the front legs of Paraceratherium are larger than the back ones. This gave him another advantage for eating and against predators. The larger you look the less chance you get eaten. A noted feature of the legs bones is that they are very finely constructed and solid. So, we find Paraceratherium had no problem bearing his own weight, massive weight. 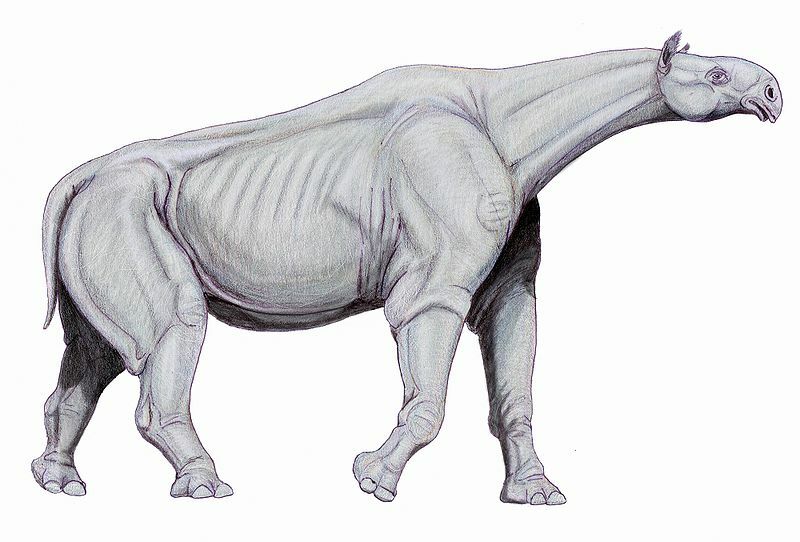 By bearing the “Largest Mammal” title, Paraceratherium has been a topic of discussion, debate and glorification . . . to the Savior that is.